If you thought that raising money for charity in Thailand is hard work, you’re right. It is. But it can be fun, too, per Paul Strachan, who spoke to the Pattaya City Expats Club on Sunday, January 26. 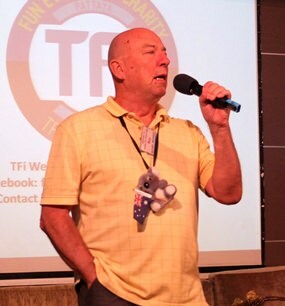 He is one of six well known members of the Pattaya expats community who created TFi, the Thai Farang Initiative. TFi believes in having fun while raising money for charity. TFi is relatively new. It organised its first fund-raising event in August 2012. The six expats wanted to do something different from what other organisations are doing. Each of the expats brought different skills to the party, such as logistics, promotion and graphic design. They wanted to create an organisation that would be transparent in its operations, and able to connect with both the community and its sponsors. Board member Roy Albiston opens the 26th of January meeting of Pattaya City Expats Club by inviting new members and guests to introduce themselves. Note flag waving Koala celebrating Australia Day! TFi has tried to make each of its fundraising events different. The first event was a 80s music night. Over 230 guests paid 400 baht for three hours of dancing and drinking, and raised 153,000 baht for various charities. 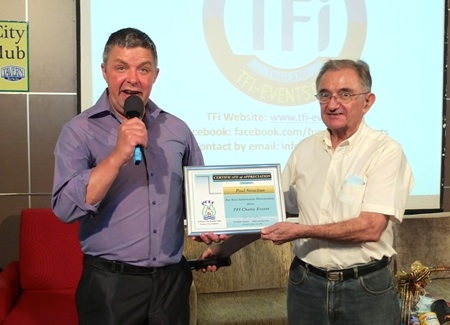 Paul explained that TFi distributed the proceeds from the event in different ways. For example, TFi teamed up with the Rotary Club Eastern Seaboard. TFi and Rotary each pledged 20,000 baht to buy 40 clean water filters for poor families at Chumchim School near Mabprachan Lake. TFi has joined forces with Pattaya Sports Club to rebuild a man’s sidecar so that he could make a living and provide for his family. TFi also helped a couple with three children build a new roof on their home; Paul showed a picture of the house and mentioned since the couple didn’t own the land and house, they did not try to build a better house as the owner might decide to evict the family and sell the property since its value would have increased. TFi donated 50,000 baht to Operation Smile to help children with facial deformities. Paul said that sometimes City Hall staff gets involved in their efforts to identify people in need. In one case TFi was helping a woman who had been bedridden and had had little to eat; when the City Hall staff learned that her last meal was the previous morning, they pitched in to immediately cook a nice dinner for her. The second event, a disco evening, raised 70,000 baht. This event had a sole sponsor – Compass Real Estate – so, the sponsor got to decide where the bulk of the funds were to be donated. They selected Dr Philippe Seur who treats people living with HIV. Dr Seur received 53,000 baht. Paul said that the money would cover HIV treatments for 20 patients for one month. However, Paul added, Dr Seur has 200 patients. That just shows how great the needs are. 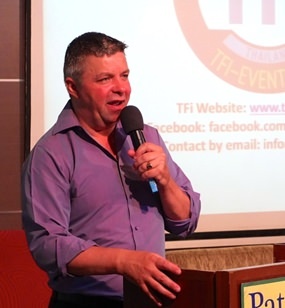 Pattaya identity, Paul Strachan, one of the founders of the TFi (Thai Farang Initiative) was the guest speaker at Pattaya City Expats Club on 26th of January. Paul’s topic was how fundraising for charity can be fun, as well as helping the less fortunate. The third event was a jolly kids Christmas at Jameson’s. Even though the event had no entrance fee, it raised 50,000 baht thanks to the sponsors. In terms of promoting its events, Paul said that Facebook is a very useful vehicle for getting the word out quickly. For more information about TFi, visit their website at www.tfi-events.com, youtube at http://www.youtube.com/watch?v=11pCVO8b3SI or send an email to [email protected] For their latest planned event, visit https://www.facebook.com/funcharityevents. After Paul’s presentation, Master of Ceremonies Roy Albiston brought everyone up to date on upcoming events and called on Tony Heron to conduct the always informative Open Forum; an opportunity to ask and answer questions about Expat living in Thailand, especially Pattaya. For more information on the many activities of the Pattaya City Expats Club, visit www.pcecclub.org. Board member Lawrie McLoughlin thanks Paul for his presentation and for his efforts for this very worthy cause, presenting Paul with a Certificate of Appreciation.